The case studies and stories below give an indication of the type of cases our members get involved in and how they support clients and their families. Ashley suffered serious head and orthopaedic injuries when he was in a motorcycle crash with an uninsured van driver some years ago. A Royal Marine from Derbyshire, was an 18-year old lance corporal when the land rover he was driving plunged off a cliff in Afghanistan. Peter was attending an 18th birthday party when he was attacked by another party-goer. 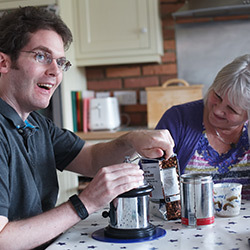 Charles suffered extensive brain damage and was left severely disabled and confined to a wheelchair following a cycling accident. Sarah’s son Jarrad was hit by a car in 2007 at the age of 12. Ms M’s son suffered a brain injury at birth which means he will need support for the rest of his life.